It was a Sunday afternoon. Kinda cloudy weatherwise, but sunny in my head. Time for a quick run to the neighborhood co-op grocery store. Me and my list. I needed a few ingredients for Over-the-Rainbow Chard Pasta from our cookbook. He was standing in front of the store, just to the right of the door. I glanced over, then quicky glanced away. I could see him coming toward me. I suspected he was a panhandler. He was going to ask for money. And he did. In a big way. “Gurmey yup poos,” he said. Very quietly. “Gimme your purse.” He was louder this time. And he nodded his head toward his jacket pocket. I followed his eyes to the handgun he held at his hip. It was big. Black. Menacing. Heart-stopping, breathtaking big. I remember being surprised at the size of that thing. I thought handguns were smaller. This was a big bleep-bleeper. I looked back up at his face. It was young. Chubby. Almost cherubic. His eyes big, brown and anxious. On his head a black knit stocking cap. In the center of the cap a big round hot-pink logo or circle. Hot pink. Can I just give you some money? Seriously. Those were the first words that popped out of my mouth when I was being held up at gunpoint. At gunpoint. Maybe it was the hot pink decor on his hat. Maybe it was his baby face. Maybe it was because the gun was held at his hip. He wasn’t really aiming it at any major organs, was he? Umm, I hate to put you out, but would you mind if we negotiated a little before you shoot me and take my purse? And then it hits me. Not a bullet, but the fact that I had hardly any money. I contemplated stopping at the ATM on my way to the store, but decided I’d just charge it. I don’t think I have that much, but I’ll give you what I have. I start digging in my purse. By now, despite the fact that I had convinced myself that he was a pretty mellow bad guy, my heart was well beyond its target zone. I find a 5-dollar bill and two ones. I hand it to him. His hand is shaking more than mine. You really shouldn’t be doing this. “I’m sorry,” he says. Then turns and sprints across the parking lot. Storm clouds appeared. I didn’t fix pasta that night, but here’s the recipe I had planned to make. Cook pasta according to package directions. Meanwhile, in a Dutch oven cook tomatoes, squash, garlic and chile pepper flakes in hot butter and olive oil over medium heat for 3 to 4 minutes, or until crisp-tender. 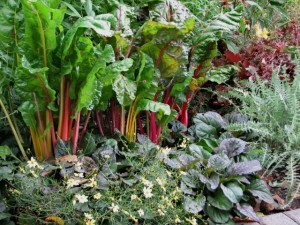 Add rainbow chard and rosemary, tossing, stirring and cooking for 5 to 10 minutes, or until chard wilts. 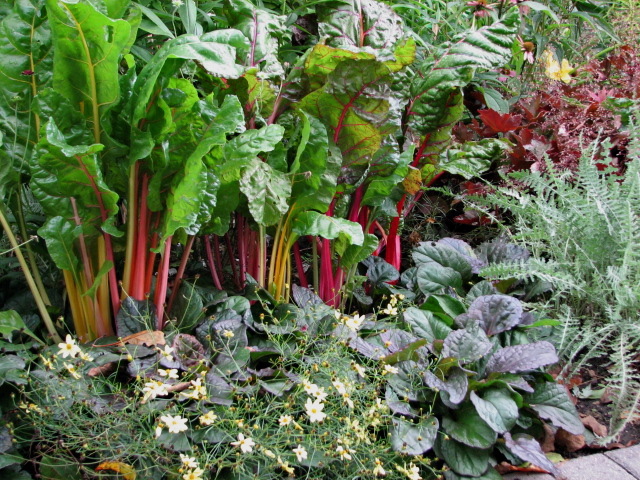 (The bigger the pot, the quicker the chard will wilt.) Pile veggie mixture all over pasta. Shower it with cheese.